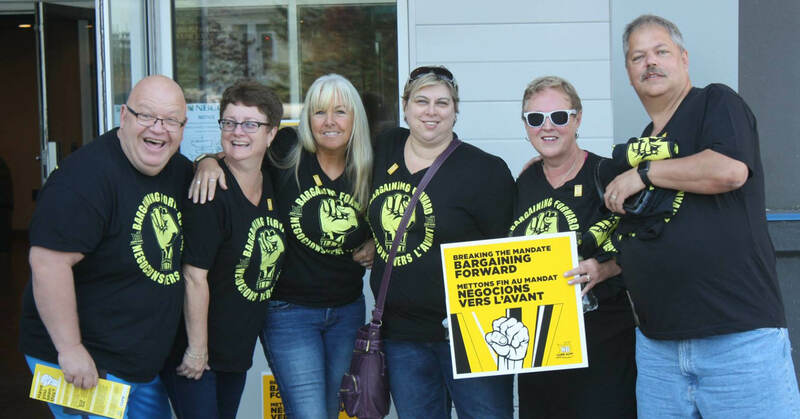 Something special is happening at provincial bargaining tables in New Brunswick. Since March 2018, provincial groups have been pushing to make gains on the exact same priority: real wage increases. As negotiations continue, sustaining the pressure on the Government of New Brunswick has required strategic coordination at all levels of CUPE across the province. The Breaking the Mandate: Bargaining Forward campaign defines coordinated bargaining as bargaining in which multiple locals negotiate simultaneously and won’t settle until everyone is ready to accept similar terms. It includes presenting the same or similar bargaining proposals to convey the solidarity and unity of locals. At the table, coordinated bargaining has allowed CUPE staff representatives to deliver the same message on the first day of negotiations across the province, highlighting the drop in real wages and arguing for the need to make up for lost ground. They used CUPE’s real wage calculator to help prepare proposals. With coordinated bargaining, information flows steadily between provincial tables, so bargaining styles can be adapted to employer proposals that shift from one table to the next. Membership engagement has been key to gathering and maintaining the strength necessary to make real wage gains at the table. We’re doing that with two complementary engagement processes: face-to-face organizing and social media campaigns. Regional Action Committees (RACs) were first created by CUPE New Brunswick as mobilization committees prior to the 1992 province-wide strike. The committees group CUPE locals by region, have elected co-chairs and are places where CUPE members gather and share cross-sectoral information and organize events. RACs have been very active since the launch of the campaign. Co-chairs, staff and CUPE NB Executive members co-facilitated membership training sessions on coordinated bargaining and membership engagement in all twelve regions of the province. In Saint John, over 150 members showed up to the first session – on a Saturday morning! Over the summer, the RACs organized family-friendly and free community events called “CUPE Gives Back.” RAC members also attended other events to leaflet and educate the public about the need for real wage increases. CUPE New Brunswick has also used Facebook to engage members in the campaign and share their stories and experiences through shareable images. Members took pictures with “Breaking the Mandate” posters to win prizes, which resulted in more materials being displayed in workplaces. Community buzz and member support are providing real clout for our negotiators at the bargaining table. The Government of New Brunswick is treading very carefully, and as the movement keeps growing, real wage increases are within our reach.